Made in the USA, Nosler custom brass is weighed and sorted for maximum accuracy and consistency. The custom brass brings premium quality cartridge cases bearing the Nosler head stamp to the reloader. 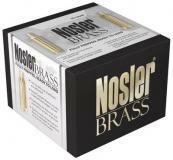 This model is 30 Nosler and comes packged 25 per box.